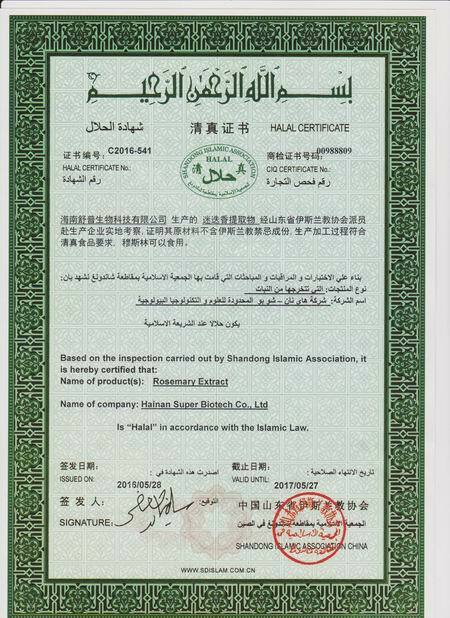 On 28th May 2016, approved by Shangdong Provincial Islamic Association, Super-Bio has received Halal Certificate. Halal Certificate is an essential enterprise qualification Certificate in international trade and a preliminary requirement for entering Islamic consumer market and countries such as Arab countries,Malaysiaand Indonesia etc. Being qualified by this Certificate helps the company improve self-management standard and product quality and, on the other hand, opens the market door of International Islamic consumer market, which enhances foreign trade of the company.